Apple's iOS 10.3 update, which is currently in beta, will be implementing changes that could limit pop-ups that ask users to review apps as well as introduce a floating keyboard for some smaller iPads. Those who have already been testing the new beta features have noted a special Reviews API that in fact puts a limit on pop-ups that ask for reviews to a shockingly reductive three times per year. There will also be an option to turn off these notifications entirely, which is a feature users have no doubt been clamoring for for some time. If you choose to do so, you can also leave a review straight from the corresponding app going forward. This is a big fix for progressively annoying and aggressive revieq requests from apps, so it'll be great to see users given a chance to curb them at the onset. As far as the floating keyboard goes, it is currently a hidden feature and has to be turned on via code settings, right now limited to iPads running from 7.9 to 9.7 inch screens. When completely finished, it might be accessible via special toggle in the form of the one users already flip when swapping between emoji and other languages on their keyboard. 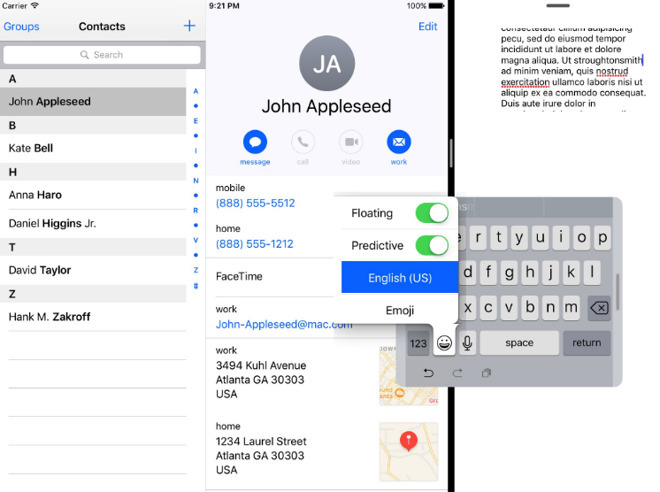 It can be dragged around the screen and is the size of a regular iPhone, which suggests there might be the idea of implementing one-handed typing going forward.